Ask: Does anyone know what the word justice means? (To treat someone or something fairly). Say: God is a just God. That means that when we do something wrong (sin) He will never sweep it under the rug. God doesn’t turn a blind eye to sin and evil in the world, just like He didn’t turn a blind eye to the sins of the Egyptians. God takes sin seriously, but He also provides a way for His people to be saved! Say: In today’s lesson we will hear about God’s justice towards Egypt and the Israelites, and how He provided a way of salvation for His people. Say: God had sent 9 plagues upon Egypt to demonstrate His mighty power so that His name would be made great. But Pharaoh refused to free the Israelites from slavery. His heart was hard towards God! 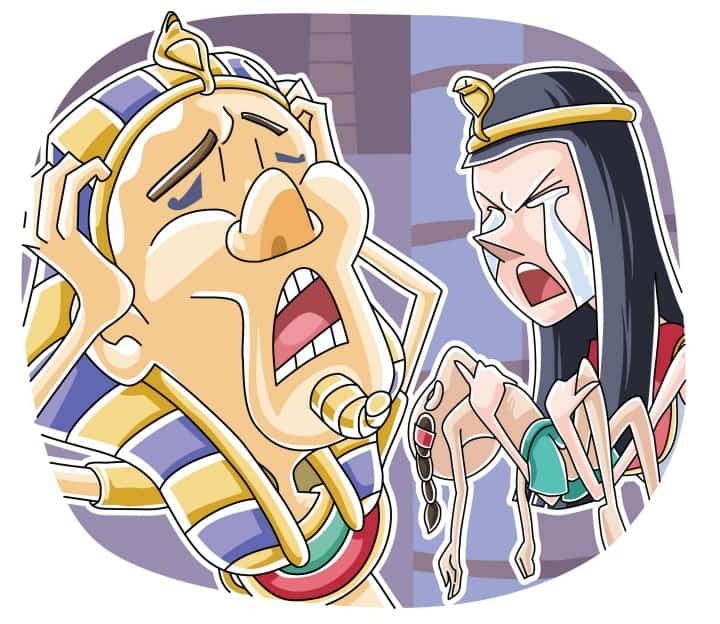 Moses had warned Pharaoh that there was one final plague coming, and it would be worse than the first nine. Let’s read from God’s Word to find out what this plague would be. Say: That’s right. The firstborn son in every Egyptian family would die. Say: Our God is a just God. That means that He takes sin very seriously and punishes those who harden their hearts against Him. God had every right to punish the Egyptians for refusing to obey Him. By sending the first nine plagues God had put His power on display for Egypt to see, yet they still remained disobedient. Now God would show His justice. Say: God had a special task for the Israelites in order to spare them from this final plague. Each Israelite family was to take a one-year old, unblemished lamb and slaughter it. They were to eat the meat along with a special meal of bitter herbs and bread without yeast. Then God gave them some other interesting instructions. Let’s read God’s Word and as we do, listen to see if you can hear what God’s instructions were to His people. Say: That’s right. He instructed them to put the blood on their doorframes. When God moved through Egypt, He would see the blood and the firstborn sons within those homes would not be killed. God was showing His great mercy on His people! Say: Did you know that even today God’s people are saved by the blood of a lamb? Jesus is just like the unblemished lambs that the Israelites were to use on Passover night. But we don’t put Jesus’ blood on our doorframes do we? Instead, when we trust in Jesus to save us from our sins, we are in a sense covered by His blood and are saved! Now, when God brings judgment, rather than face punishment, God passes over us and forgives our sins. Say: That night God moved through Egypt and just as He had said, all the firstborn sons died, including Pharaoh’s own son. How is the blood on the doorframes like Jesus’ blood shed on the cross? Have kids sit in a circle. Choose one person to start telling the story using only one sentence. The next kid will continue the story using one more sentence. Go around the circle until the whole story has been re-told. Draw a large doorframe on the board and ask what it was that God told the Israelites to spread across their doorframes. Pray that the kids would trust Jesus to forgive their sins. Tony Kummer (Editor) reviewed & updated this page on : November 16, 2015 at 9:28 pm. All our content is peer reviewed by our readers, simply leave a comment on any post suggest an update.